Members often ask me what has happened with Richard (Charlie) McCracken and John Wilson and their band, Stud. The following article will give you an idea of this group as comprehensive as possible, made up of the few reports and articles which I've found in my archives. After the studio work, they went back on stage the next album followed already in fall '71. 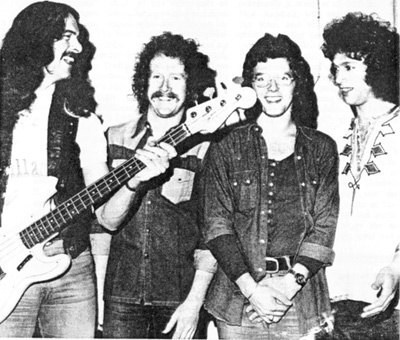 Shortly before John Weider (violin, piano, guitar) had joined the band as fourth member, who had been with Eric Burdon's Animals and the Family. This album was also recorded at Command Studios and published at the end of '71, entitled “September”. In the meantime, Stud had changed the record company so that this album had the label “BASF”. “September” was quite different from the debut album, a fact which might be put down to John Weider, who wrote most of the songs. They had left the jazz-rock style, the new album was remarkably versatile, it was jazz, blues, funk and bluegrass-influenced. Songs like “Good things” ,”Bad handlin'" or particularly “Red Wine" were excellent, whereas others such as “Corner” or “Ocean Boogie" were not so good. Other songs on the album: “God knows”, “Life without music”; “Samurai”, “Five to Midday”, “Prelude”. Having published the album, they did further tours across Europe. However, they toured mainly in England. The fact that Stud were particularly popular in Germany can be gathered from the poll of the German magazine Sounds. When the newcomer group of the year was chosen they held fourth place, which was a surprisingly good result. They were listed after Wishbone Ash, Mountain and Pink Fairies and before Hawking, Gentle Giant or Curved Air. They had, for example, twice as many votes as Rory! Their longest German tour started in Hamburg on 12. April 1972. Among other places they played Dortmund, Osnabruck, Emden, Aachen, Recklinghausen 25 and Tubingenn. The tour was finished on 1 May when they gave their final concert in Freiburg. On this tour, Stud was supported by Anno Domini, who also turned the fans on a year before on the German tour. It was also they who started the concerts on the last German tour of the Taste. Back in London, they had another meeting at Command Studios, also in May. At this time the split-up of Stud was almost decided. Therefore they gave a live concert with audience at the studios, which was meant sort of a farewell present and should be recorded too. There was only one new song on the album, "Big Bill's Banjo Band” a solo performance by John Weider. In addition to these two more acoustics, neither of them longer than three minutes. The other songs (Horizon No.2, Harpo's Head No.2) were first-class jazz-rock. I must admit that, apart from Colloseum, I've never heard something more electrifying or better of this kind. On their first album, John Wilson was the dominant musician, on the second one it was John Weider, on the third one John Wilson again. On this live album, Wilson demonstrates for the first time, all his skill to the greatest extent. You can hardly believe that this super musician has disappeared. July meant the split-up for Stud. The main reason was that John Weider got married in the States. John Wilson too, had talked about a split-up here and there. Therefore they gave farewell concerts in Germany and England in June and July. Besides their live album, again on BASF, "Stud Goodbye, Live at Command" was published. And believe it or not, these tours were their most successful ones. Maybe the people had eventually understood that this was not "Taste Part 2.” Moreover, they made much more profit on the live album than on the first and second one. But, unfortunately, it was decided that Stud would split-up definitely in July. Another interesting matter: each album Stud has also been published in Israel! What have the musicians been doing afterwards? You can find some information on that in the Deuce biographies, at least on Richard McCracken and John Wilson. Before playing with Stud, Jim Cregan was with Blossom Toes and Julie Driscoll. Afterwards, he played with various bands: Family, Stevie Harley & Cockney Rebel, Streetwalkers, Linda Lewis, Bruce Roberts, Hinkley's Heroes, Murray Head, Mike Batt. He's been leading an eventful life. Stud was preceded by the Animals, Brinsley Schwarz, Home and the Family, and followed by Roger Morris, Domenic Troiano, Moonrider, Johnny Kidd & The Pirates, Nicky James and Flash Fearless. In addition, he recorded his first solo album in 1976 with Richard McCracken on bass. And now, what does Rory say about the music of his ex-colleagues? "Richard and John are both most perfect musicians. I like Stud. But that's nothing to do with my music anymore. " Unfortunately all albums are sold out.